HOUSTON (CN) – Boosted by their first World Series win in franchise history at Dodger Stadium in Los Angeles on Wednesday, the Houston Astros are looking to build on that momentum as the series continues Friday night in the city that was ravaged two months ago by Hurricane Harvey. The Los Angeles Dodgers and Houston Astros set a World Series record for home runs in one game Wednesday, belting eight, five of which came in extra innings, with players crediting the unusually warm Southern California night for making the ball fly off their bats. 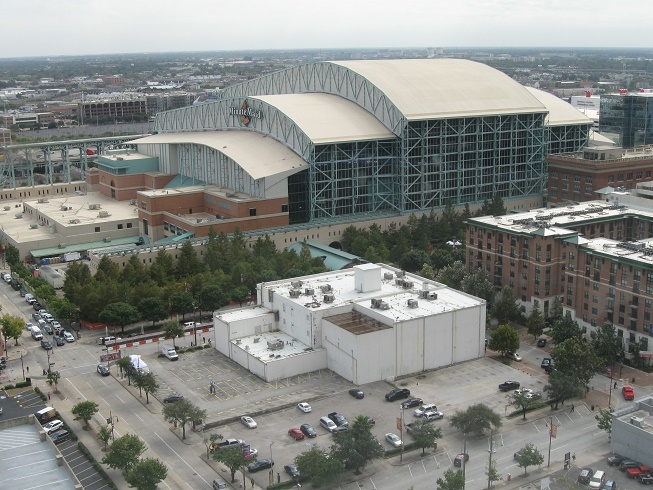 The Astros’ first and only World Series appearance was in 2005, when they were swept in four games by the Chicago White Sox. 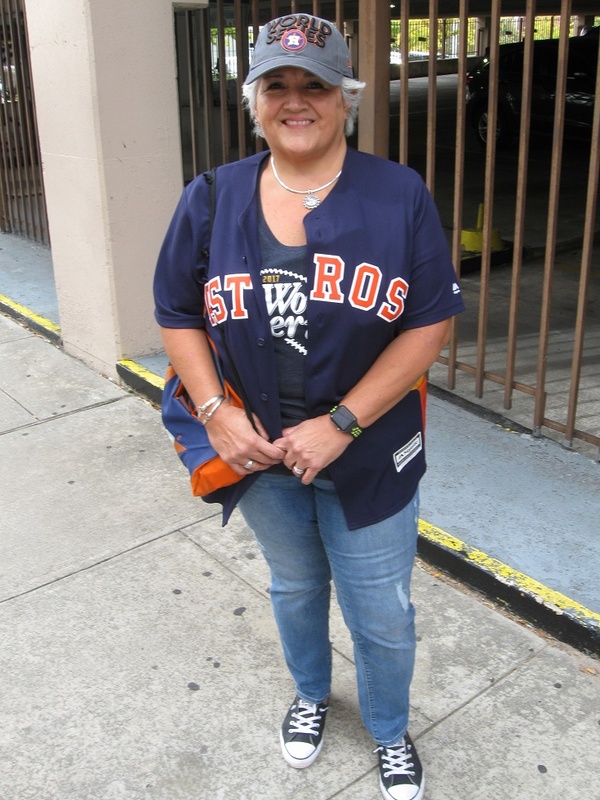 Debbie Maples, 53, bubbled with excitement as she walked towards Minute Maid Park in downtown Houston on Friday, five hours before the game is set to start at 7 p.m. CST. “This is a bucket list for me, I didn’t get to go to the first World Series here in 2005,” said Maples, a clinical support analyst for a Houston hospital chain. She said she lives in the southwestern suburb Richmond, where she and her family were forced to leave their home under a mandatory-evacuation order in late August, as Hurricane Harvey’s deluge swelled the Brazos River to record levels. Though her house was not among the thousands damaged by Harvey, she said the storm impacted everyone to some extent in the nine-county Houston region that’s home to more than 5.6 million people, and the Astros’ postseason run has lifted people’s spirits. “We all suffered through Harvey and I think it’s a huge thing, not only for Houston but the surrounding cities as well,” she said. She said she planned to spend the afternoon just hanging out at the ballpark, waiting for her husband to get off work to meet her at the game for which they purchase standing room-only tickets. Maples’ favorite Astros player is second baseman Jose Altuve, the league’s shortest player at 5-foot-6 and one of its best hitters. “I think he’s just the cutest thing and he’s the best player. He plays with all his heart,” she said. Altuve has led the American League in hits the last four seasons. He accepted the Hank Aaron Award as the most outstanding offensive player in the AL on Wednesday, from Hank Aaron himself. Altuve is renowned for his ability to get base hits off pitches from his shoelaces to his eyeballs, and he once jumped a foot in the air to foul off a 93-mph fastball during a game against the Texas Rangers. A 63-year-old man whose last name is Patino had just finished his shift with Harris County’s IT department on Friday when he stopped to chat about the Astros. He said he moved to Houston at age 3. Like Maples, he said Altuve is his favorite player. “He’s consistent. He’s plays great, so hard. I’ve never seen a player who’s played so well for Houston and I’ve been following them for 40 years,” he said. “I wore one for the first game with the Dodgers that I had worn when they beat the Yankees, but of course it didn’t work for the first game. So I kind threw that off. It’s just one of those things you carry over, you just try to do what you think maybe will help any way you can,” he said. The Astros clinched the AL pennant with a 4-0 win over the New York Yankees on Oct. 21 in Houston, before losing the first World Series game 3-1 to the Dodgers on Tuesday. Bars and restaurants in downtown Houston were surprisingly empty around 2 p.m. on Friday, possibly due to blustery wind and chill in the air that’s a welcome relief to locals after an interminable string of humid, 90 degree-plus days that stretched from summer into early October. With new buildings seemingly going up on every downtown block, the beeps of heavy equipment, the clangs of hammering construction workers, and the buzz of their saws were ringing through the streets Friday, carried on the canyon-like wind tunnels formed by blocks of skyscrapers. There were a few specks of Dodger blue amid the Astros orange. Jim Willon, 56, wore a Dodgers hat Friday and said he came to town Thursday afternoon to watch Games 3, 4 and 5 at Minute Maid Park. A San Diego, Calif, resident, Willon resembles NBC anchor Brian Williams. He said he was very curious to see how Houston was doing after Harvey. He said he hopes the Dodgers will take all three games in Houston and make a trip back to Los Angeles unnecessary, but he expects the series to return to Dodger Stadium. If the Astros win the World Series, it will fulfill a bold prediction Sports Illustrated made for the franchise in June 2014. The Astros had finished last place in their division for the last four years when the magazine predicted that their advanced scouting methods, which analyze players’ statistics along with their family backgrounds and personalities, would pay off with them winning the 2017 World Series. Sports Illustrated hedged its bet earlier this year, changing its pick to win the 2017 World Series to the Los Angeles Dodgers. Even with Sports Illustrated favoring the Dodgers, things are looking up for the Astros, as the magazine’s staff has not picked a World Series winner for the last 17 years.